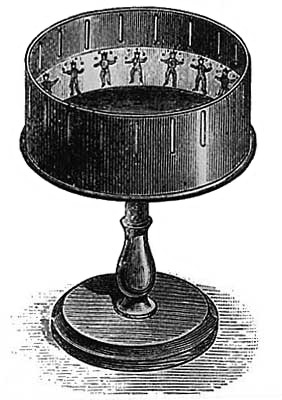 he zoetrope was invented by the British mathematician William George Horner in 1834. It was very similar to the phenakistoscope, but was more three-dimensional, did not require a mirror, and could be enjoyed by more than one viewer at a time. Instead of a circular phenakistoscope-like image carrier, where each image (or “frame”) was allocated a pie-like wedge of space, Horner’s zoetrope had a round metal bucket into which a rectangular (and thus more film-like) animation strip was placed.